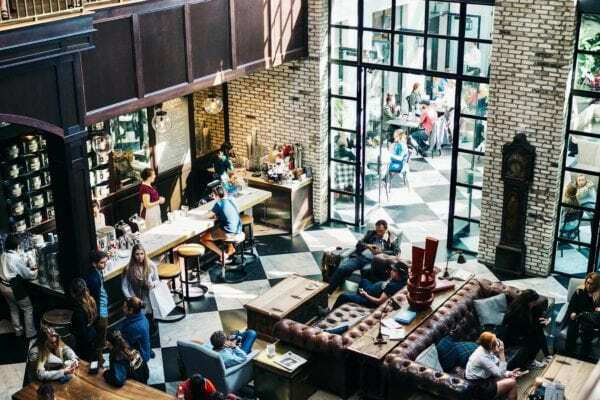 To raise a new generation of restaurant-loving customers, entertainingly educational initiatives might be more effective than the banishment of younger patrons. The juxtaposition of the words “children” and “restaurants” usually goes hand-in-hand with provocatory headlines about businesses banning young customers from a certain hour onwards or willingly failing to provide accommodations such as high chairs, with the owners claiming that business thrives because of these policies. Maybe it does for some. But the restaurant industry is far from being a child-averse environment — and we’re not talking about places catering to kids specifically. In fact, there are plenty of family-inclusive establishments that do great business for everyone. The key: creating an environment where both families and child-free diners feel comfortable. Voltaire, a French-American bistro in Boerum Hill, Brooklyn, has a similar disposition: they’re happy to fit strollers in their space when occupancy allows it and have four high chairs available. They’re in the process of rolling out a program consisting of movies in the backyard and small bites on Tuesdays afternoons. “It’s that weird time of day parents talk about, between 4 and 6 pm, as in, ‘What do I do with kids at that time? '” Voltaire co-owner Rob Morton told Skift Table. Beyond an accommodating environment and entertaining experiences, though, restaurants are also striving to appeal to younger crowds when it comes to food offerings, the main reasons being a general refinement of the average American palate and the growing tendency of families to have their spawn in restaurants. “We are starting to see less of a differentiation between “kid” and “adult” palates,” says Joey Worley, the director of food and beverage at Windsor Court Hotel’s The Grill room. “If the adults have sophisticated palates, generally speaking, their kids will as well. Not to say that kids are feasting on foie gras and lobster, but there is a good chance that if mom and dad are enjoying items such as those, the kids will likely be enjoying a medium-rare steak or nicely cooked piece of fish. At Del Frisco’s Grille, the sister brand of the more formal Double-Eagle Steakhouse, the environment is family friendly, even without a dedicated children’s menu. Children are fond of the lollipop chicken wings served buffalo style with blue cheese crumbles and house-made avocado ranch dressing and truffled mac and cheese. “Although American cuisine is at the center of the Grille concept, we made sure to incorporate elevated, fresh ingredients and creative twists into our kid-friendly dishes to appeal to both kids and their parents,” said concept chef Shawn Quinn. At Galley in Hilton West Palm Beach, the kids’ menu consists of dishes that children already recognize, such as pizza, but garnished with upscale ingredients, such as artisanal cheeses and lobster. The restaurant’s best seller? The “Lobster Thermidor” Pizza, topped with with crème, arugula, and blend of Mozzarella, Boursin, parmesan cheese, and Maine lobster. Those initiatives are not limited to food only. Michelin-starred restaurant Plume in Washington, D.C. also decided to introduce children to the pleasure of pairing food with beverages, by rolling out a child-friendly cocktail cart. “The concept of the cart originated from the growth in young diners at Plume,” said restaurant manager Sean Mulligan. “As they tag along with their parents and elders, kids with access to the cart feel like they’re part of the complete, Michelin-starred Plume experience.” If they choose a crudité dish, for example, they’re offered the so-called Cuvée No. 25, a sparkling juice with organic sloe plums, aronia berries, pears and currants.